Traditionally used in municipal sewage treatment, our products have evolved and are now installed in landfills, breweries, dairies, and food-processing plants, where anaerobic digestion is used for solid waste treatment. The Varec Biogas 244E Enclosed Burner Systems are designed to burn biogas efficiently and safely over a wide range of operating parameters. With no visible flame, the 244E systems use an innovative stack design to naturally induce the proper amount of combustion air which guarantees high destruction removal efficiency. The design of the 244E allows for complete combustion of the digester gas or landfill gas. The unique stack design takes advantage of the natural draft properties of the combustion process to draw in the correct amount of air necessary to provide complete combustion. This is all done without the need for motorized dampers and complicated control systems. Independent tests have shown Destruction Removal Efficiencies (DRE) in excess of 99% and low NOX and CO emissions. The 244E enclosed burner system is not a time and temperature based flare. Its design is constructed to allow combustion air to be naturally inspirated and obtain the proper air-gas mixture, thus achieving the optimum operating temperature necessary for complete combustion to occur. The 244E’s innovative combustion stack design eliminates the need for refractory lining and insulation to protect the chamber of high temperatures since cooling air is naturally induced in the stack section openings. This also eliminates the need for heat shields and structures. The 244E Enclosed Burner System is cost effective and its design makes for easy and reliable operation and maintenance. No motorized or manual dampers required to bring in combustion air. HMI Touchscreen panel standard on NEMA 4X control panel. 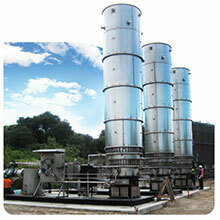 The Varec Biogas 249 Series Enclosed Flare is a flare specifically designed for biogas application. 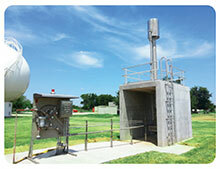 It is primarily used in areas where flare stack emissions are controlled and regulated. The sophisticated design of the 249 Series is a top-of-the-line, full-featured, drop-ship product, where all eventualities have been carefully considered at the design phase. After the product is shipped, our qualified Varec Biogas Field Service Engineers are present for commissioning, start-up and personnel training, and will work in conjunction with the Contractor or the Maintenance/Operation Personnel at the plant. Destruction Removal Efficiencies (DRE) of 99.95%%. Low NOX and CO emissions. High turn down ratios available. 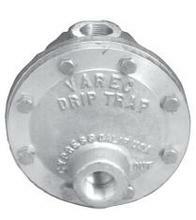 Varec Biogas 245 Drip Trap is designed to remove condensate automatically by utilizing a float operated needle valve. When condensate accumulates in the drip trap reservoir, it lifts the float which is connected to a lever arm. The lever operates the needle valve to drain the condensate. 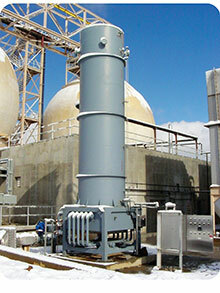 The unit is designed to prevent gas from escaping while draining. The float is positioned within the reservoir so that the needle valve closes when the liquid level is still above the outlet port. Standard materials of construction are corrosion resistant low copper cast aluminum body and cover, with stainless steel internal working parts. Inlet and outlet connections are 1-inch NPT.Condensate reservoir capacity is 2.0 quarts (1.9 liters). A drain plug is provided to permit manual draining of the reservoir. Maximum working pressure is 25 psig (172.5 kPa). Check your local rules regarding the use of float-operated drip traps. Corrosion resistant, marine-grade aluminum construction. Automatic operation using a float-operated needle valve. Check local design standards prior to specifying. The Varec 52OO Series Flame Check is designed to stop flashbacks in small pipe lines carrying flammable gases. Flame checks are installed in small pilot lines to fuel burning devices, in vent piping from manometers and diaphragm operated regulators. The flame check should always be installed as near as possible to the open end of the vent pipe or source of flame. Flame checks prevent the propagation of a flame through the principle of dissipation. If a flashback is generated, it is extinguished before it passes through the internal element. The compressed woven wire element absorbs heat from the flame front faster than it is developed. The temperature of the flame is lowered below its ignition point, thus quenching the flame. 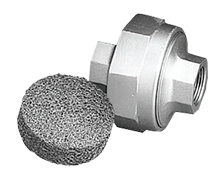 The large net free area in the flame arresting element provides increased flow capacity with minimal pressure drop. In addition, the element design maximizes surface area for greater dissipation of heat resulting in maximum fire protection. The Varec Flame Check housing is designed similar to a pipe union permitting easy disassembly to remove the flame arresting element for inspection and cleaning. The Varec 5200 Series Flame Check is available in .25" through 2" sizes with NPT connections. The housing is constructed of low copper cast aluminum which is non-corrosive in hydrocarbon gases and resistant to H2S and other corrosive elements. The flame arresting element is 316 stainless steel. Maximum working pressure is 25 PSIG (172 kPa) as standard. 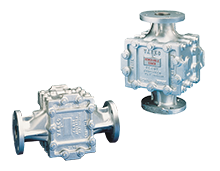 The VAREC 5000/5010 Series Flame Arresters are used in gas piping systems or on petroleum storage tank roofs or digester covers. They are designed to stop the propagation of flame (Group “D” gases) from external sources and can be mounted up to 15 feet upstream of the ignition source in accordance with UL Approval; or 10 pipe diameters in accordance with FM approval requirements. 5000 Series is for vertical installation. 5010 Series is for horizontal or vertical installation. Heavy wall cast housing in 356 HT aluminum, steel, or 316 S.S. The Varec Biogas 233 Series Condensate and Sediment Trap should be installed immediately downstream from each digester to remove the large volume of water which condenses when the gas cools as it exits the digester. 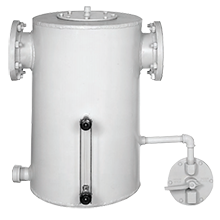 In addition, sediment which is entrained in the gas will drop out and accumulate in the trap, protecting downstream equipment from damage caused by solids. Varec Biogas Model 233 Condensate and Sediment Traps may be installed at other locations in the gas system where large volumes of water must be removed. These sediment traps are designed for working pressures up to 25 psig (172 kPa). Note: When a Varec Biogas Drip Trap is installed, the pressure rating of the drip trap determines the maximum allowable working pressure for the assembled unit. The Varec Model 231 Foam/Gas Separator is designed for use in piping systems to remove foam caused by agitation from the digester discharge gas. The foam must be dispersed and collected in order to protect downstream equipment from corrosion or clogging. The Foam/Gas Separator is typically installed in the gas piping as it exits the digester. Entrained foam and solids are removed from the gas as it flows through the device. This is accomplished by subjecting the gas/foam mixture to a direct spray of water inside the chamber. The gas must then rise vertically nine feet past an internal baffle in order to flow from the tank. Foam and solids are heavier than gas, and the combination of the large vertical rise the gas has to travel, and the continuous spray of water will knock the foam out of the gas and direct it to the bottom of the chamber. The foam is removed via a drain connection. A visual flow indicator is provided in the drain line to confirm water flow. Liquid level switches allow high and low-level alarms to be used. At low water condition, source power is routed through the low-level switch to a low water alarm. Once the water level rises above the low-level switch, power is routed to the water solenoid valve energizing it open. If for any reason, the water level rises above the high level switch, power is then routed to a high level alarm. At this high level condition, the "knock down" water solenoid valve is de-energized closed which stops the water flow. Alarms for high and low water level.